Its been 3 weeks since the launch of bigger Nexus 6 by Google and in India, we never got its official pricing. 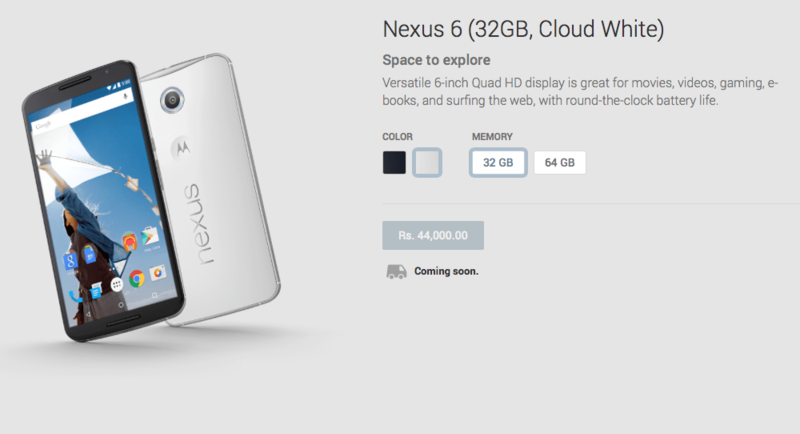 To calm down, this Nexus 6 India price is Rs 44,000 for 16GB variant and Rs 49,000 for 32GB variant. And yes, this pricing is actually very decent because on the other hand we are of course getting a 6″ QHD display loaded on Snapdragon 805 processor, combined with 3GB RAM. This Motorola developed device can be said to be a sized up Moto X(2nd Generation) device with a higher price tag. HOT: Is this Lenovo’s very new iPhone 6? You are right! Note 4 is significantly priced higher against this beast with similar processors. On the camera side of Nexus 6, we will be shooting some portraits via 13MP back camera and selfies via 2MP front camera. With a magnetic power of Motorola’s very new Turbo charger, this device should be your very first choice if you are going beyond Rs 40k for an Android based smartphone(actually Lollipop based smartphone). Is this next generation Moto E? Release date is yet to be announced but one can expect it before the end of this month(or may be by 20th November with very limited stocks). Flipkart is all ready to bring this giant device on its official portal. Of course the pricing will be same, it is Nexus. What do you got in your mind for/against this Nexus 6 India price?